An effective chemical root control product, Vaporooter is guaranteed to kill roots on contact and prevent growth in sanitary sewer systems for a period of three years following application. The North America Society for Trenchless Technology (NASTT) has released a schedule of its Trenchless Good Practices courses for the remainder of 2010 and into 2011. These programs benefit utility contractors and municipal organizations alike. NASTT educational and training programs cover a wide range of trenchless methods and are designed for experienced professionals, as well as newcomers to the industry. Pueblo West executive and Distribution Contractors Association Past President Keith R. Swerdfeger won the election for his second run at the Colorado State House of Representatives District 47 seat being vacated by Democrat Liane "Buffie" McFadyen. McGraw-Hill Construction, part of The McGraw-Hill Companies, released its 2011 Construction Outlook, a mainstay in construction industry forecasting and business planning, which predicts an increase in overall U.S. construction starts for next year. The level of construction starts in 2011 is expected to advance 8 percent to $445.5 billion, following the 2 percent decline predicted for 2010. The EPA has awarded $485,000 to the city of Topeka, KS, for improvements to its drinking water and sewer systems. The project is expected to be completed by the summer of 2012. The Interstate Natural Gas Association of America (INGAA) released a white paper, Interstate Natural Gas Pipeline Efficiency, analyzing the achievements and challenges in connection with optimizing the energy efficiency of natural gas pipeline transportation. As reported in The Mercury News, PG&E's costs related to the San Bruno, CA, gas-line explosion could climb to more than $1 billion, according to data the utility made public in November, fueling fears over how much of the tab its customers may end up paying. Five leading off-road equipment industry associations have published a "frequently asked questions" (FAQ) report about Tier 4 technology – the next generation of clean diesel emissions standards established by the U.S. Environmental Protection Agency (EPA) under the federal Clean Air Act. These standards apply to new diesel engines used in off-road equipment beginning in 2011. Michels Pipeline Construction, a division of Brownsville, WI-based Michels Corp., has been awarded spreads 1-4 of TransCanada’s Keystone XL Gulf Coast Expansion Project. Michels Pipeline Construction will install 371 miles of 36-inch pipe running from Payne County, OK, to Angelina County, TX. Michels Directional Crossings will also perform 19 directional drills required along the route. The U.S. Environmental Protection Agency (EPA) has announced nearly $300 million in federal funding to improve aging water and wastewater infrastructure and protect human health and the environment for people in the state of California. This new infusion of money through infrastructure capitalization grants will help state and local governments finance many of the overdue improvements to water projects that are essential to protecting public health and the environment throughout California. The U.S. Army Corps of Engineers, St. Louis District, MO, has awarded a $9.178 million contract to SAK Construction for the Old Mill Creek Phase 1A project for the Metropolitan St. Louis Sewer District. The project, which targets the aging Old Mill Creek Sewer and smaller connecting sewers, is designed to eliminate or control related sewer overflows that affect both the city of St. Louis and St. Louis County, MO. Charles Stringer, assistant director of Water Operations for the Dallas Water Utilities, Dallas, TX, did double duty when he delivered presentations at two chapter meetings for the Underground Construction Technology Association (UCTA). Attendees at the Gulf Coast Chapter meeting held in Houston on Oct. 12 and those who attended the new North Texas Chapter meeting in Euless, TX, on Oct. 14 had the opportunity to hear about the city of Dallas’ recommended 2010 Capital Improvement Plan. On December 2, Earth Tool Company announced that a settlement has been reached between The Charles Machine Works, Inc. (CMW), Earth Tool Company, LLC (ETC), and Vermeer Corporation regarding litigation related to the purchase of ETC by CMW. VUEWorks Inc. and its channel partner Ruekert-Mielke Inc. of Waukesha, WI, announced that the city of Waukesha has selected its VUEWorks software for city-wide, GIS-integrated asset management. Waukesha plans to comprehensively track the condition and minimize failure risk of various assets, optimize expenditures and improve service delivery of its physical infrastructure. Advertisers from the print edition of <em>Underground Construction</em>, December 2010, Vol. 65 No. 12. The Plastics Pipe Institute, Inc., (PPI) announced Dec. 7 that it has an open position and is seeking a qualified professional engineer for its Fuel Gas (FGD) and Building and Construction (BCD) divisions. 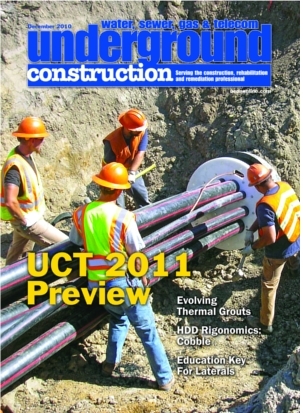 As the countdown to the 2011 <a href="http://uctonline.com">Underground Construction Technology International Conference & Exhibition</a> continues, the scope of the overall program is worth exploring. While the primary educational program runs Tuesday, Jan. 25 through Thursday, Jan. 27, a strategic inclusion of special programs rounds out almost a full week of educational opportunities. Designed to inspect sewer and stormwater infrastructure at a fraction the cost and time of traditional methods, the QuickView zoom survey camera incorporates new patent-pending Haloptic technology to boost the range, alignment and precision of its illumination. Masterliner can transform a problem pipe into a new, strong, leak proof system in a matter of hours. Cherne Rupture Disc Technology is now available for large diameter Test-Ball and Muni-Ball plugs. RS MaxPatch is a new alternative to sectional point repair. Successful Premiere For Direct Pipe In The U.S. In order to comply with Florida’s increasing demands for energy while ensuring reliable supplies of natural gas, the Florida Gas Transmission Company is currently expanding its pipeline network. The Phase VIII Expansion project adds 772 km (480 miles) of pipeline to the network, allowing more gas to be transported from Houston to Florida. This additional natural gas is primarily used for electricity generation in local power plants thereby covering the daily power requirements of up to 1 million households. Misaligned manhole frames in streets often cause driving hazards, failure of pavement around the frames, cause poor access to manholes, may be responsible for inflow and infiltration and can also result in other problems. Because manhole frames are not manufactured to be adjustable, efforts to make repairs is time consuming and often ineffective. Rubber tire trenchers from Ditch Witch, Astec Underground, Vermeer and Mid America Trenchers. The Metropolitan St. Louis Sewer District (MSD) is in the midst of a multi-million dollar, multi-year capital improvement and replacement program that is expanding and rehabilitating the district’s entire wastewater collection and treatment system. It is the largest, most extensive improvement program in the history of the district. After three years on the road, the annual Underground Construction Technology International Conference & Exposition (UCT) returns to Houston from Jan. 25 -27 at the George R. Brown Convention Center. UCT is the underground construction industry’s premier trade event, focusing exclusively on the underground construction and rehabilitation markets. It is the only annual industry event that brings together contractors, utility providers, consulting engineers, manufacturers and service providers in a true business and educational environment. Finding ways to effectively address problems posed by deteriorating laterals is one of the most serious challenges municipal and utility districts face in rehabilitating sanitary sewer infrastructures. In this article, several industry representatives say what they believe is necessary to make significant progress in bringing laterals up to acceptable standards. Industry representatives sharing their views for this report agree on many points, differ on others. A U.S. Environmental Protection Agency (EPA) report published earlier this year contains a wealth of information about rehabilitation technologies available for sewer force mains. The report, “State of Technology Report for Force Main Rehabilitation,” was prepared as part of the EPA’s Sustainable Water Infrastructure Initiative. Here, the principal author of the report gives his summary of the contents. Cobble -- usually rounded pieces of rock that can range in size from a marble to a basketball -- is considered one of the most difficult and challenging soil conditions for making a directional drilling installation. “Cobble is not fun,” said Boyd Simon, P.E., field services division manager for Ranger Directional Drilling. Projects requiring excavation are recognized as among the most dangerous in construction, and protecting personnel who must work in trenches and surrounding areas from cave-ins is a priority with life and death implications. For small jobs, trench protection may be as simple as dropping a trench box into the excavation. Larger jobs are more complex. A major project often requires extensive engineering and the use of specialized shielding and shoring. In just a few short decades, the use of horizontal directional drilling, as a method to install pipelines and utilities, has become common place. The advantages of HDD are two-fold. HDD has already saved billions if not trillions of dollars in bottom line construction costs. Grouts have a multitude of uses for many types of construction. For utility construction, grouts are most often thought of for sealing leaks and joints in water and sewer pipe infrastructure, manhole rehabilitation and filling annular space between pipes and surrounding structures. The Environmental Protection Agency (EPA) may require pipelines to severely reduce the presence of polychlorinated biphenyls (PCBs) throughout their systems, a move which would cost the industry tens, and potentially hundreds, of billions of dollars, according to the American Gas Association. Pamela F. Faggert, vice president and chief environmental officer, Dominion Resources Services, Inc., says the new regulatory measures the EPA is considering could cost her company alone a minimum of $300 million.